I get this question a lot. On my website I offer both J-Pole and Slim Jim antennas in VHF and UHF configurations. Shoppers sometimes have a hard time making a decision on which will be best for their needs and will ask which is better for them. But with any question, there is the short and (sometimes) snarky answer and the longer answer that delves into the root of their particular needs. Which leads me to say: There is no such thing as a perfect antenna, just antennas that are ideal for your particular needs and situation. Antennas, especially VHF and UHF antennas come in a myriad of designs and configurations. Some people would lead you to believe that the highest gain antenna is the best antenna. Who would want a 3dbi antenna when you could put up a massive 9dbi antenna. But did you ever wonder why antenna manufacturers offer several similar models, each with different gain factors? They know the dirty little secret that the highest gain antenna isn’t always the best antenna choice for a particular location. For example, I offer two different antenna designs: the J-Pole is a half wave end-fed vertical antenna with about 3dbi of gain and the Slim Jim is a half wave end-fed dipole antenna with about 5.5dbi of gain. In choosing between the J-Pole or the Slim Jim antenna the antenna height and your average terrain will play a large factor in which will work best. If your location is at or above the average terrain, the higher gain antenna like the Slim Jim may be the better choice. Otherwise if you are located in a valley or are quite a bit below average terrain, I’d choose a lower gain antenna like the standard J-Pole. The reason is the RF energy takeoff angle of the antennas. The Slim Jim has a 7 degree takeoff angle, so it concentrates more of the signal towards the horizon. The J-Pole’s radiation pattern is more like a rounded donut shape with a 20 degree takeoff angle. So if you are in a low spot, the lower gain J-Pole will actually give you better coverage. How do I know what my average terrain is? One good method is to use the FCC’s Height Above Average Terrain (HAAT) calculator. This handy tool provides information that is used to register broadcast antennas, and coordinate commercial and ham repeater antennas. But the calculator can be used as a personal reference for your own antenna systems. To use the HAAT calculator, enter your location (use this to find your latitude, longitude, and height if you don’t already know it), antenna radiation center above mean sea level (your height + the height of the antenna) in meters, and the number of radials to calculate on (use 8). I entered my location and height and found out that I live -6 meters below HAAT. 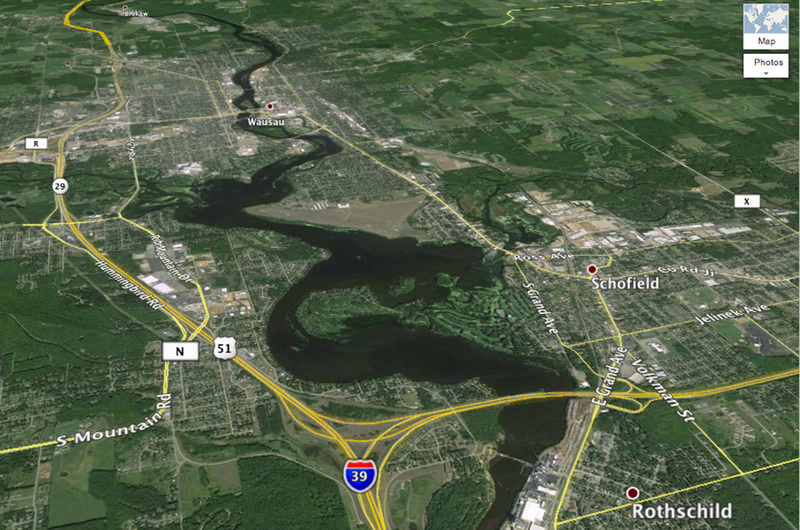 Living in a river valley, I know that I’m in a very low spot compared to our average terrain. Hopefully you’ll get a more favorable HAAT calculation for your location. So how is HAAT calculated? 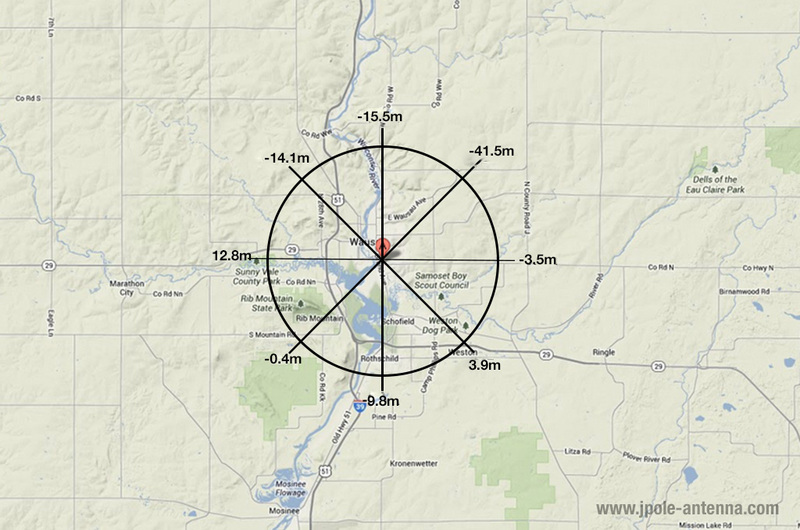 The calculator takes your location and height, and looks up the elevation according to USGS survey information. 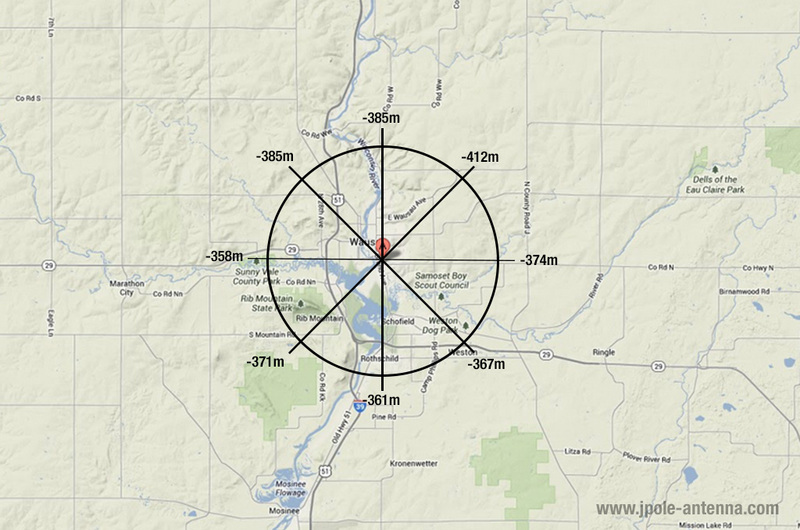 It then takes 50 evenly spaced elevation samples between 2 and 10 miles on the eight radials from the center point of your location. these numbers are then averaged to give you your HAAT or Height Above Average Terrain. Visuallizing your HAAT data like I did on this chart I manually graphed out can give you insight on which directions your atenna system will best perform. Terrain can make a big difference in the range of your antenan. If your HAAT is negative (like my -6 Meters below HAAT) then a low gain antenna with a higher takeoff angle, such as the J-Pole, will work best for you. If your HAAT is at or above average terrain, then I’d recommend taking advantage of your location by installing a high gain antenna, such as the Slim Jim, that concentrates more of the signal near the horizon. I find that the J-Pole gives me better performance at my house than the high gain Slim Jim, but if I lived on the top of a hill, I’d pick the higher gain Slim Jim any time. The higher the HAAT, the higher gain of antenna you should choose. If you have a low or negative HAAT, a lower gian antenna with broader pattern will better suit your needs. Take those figures with a grain of salt, though. The HAAT calculator is a great tool to give you an idea of your terrain, but it shouldnn’t be the only determination of what antenna to use at your location. You’ll also want to consider space, neaby structures and urbanization, and of course the purpose that you’ll use the antenna for. But it’s a good starting point in assessing your antenna needs. What’s your HAAT calculation? Feel free to share it in the comments below. What's the best VHF antenna for your location? 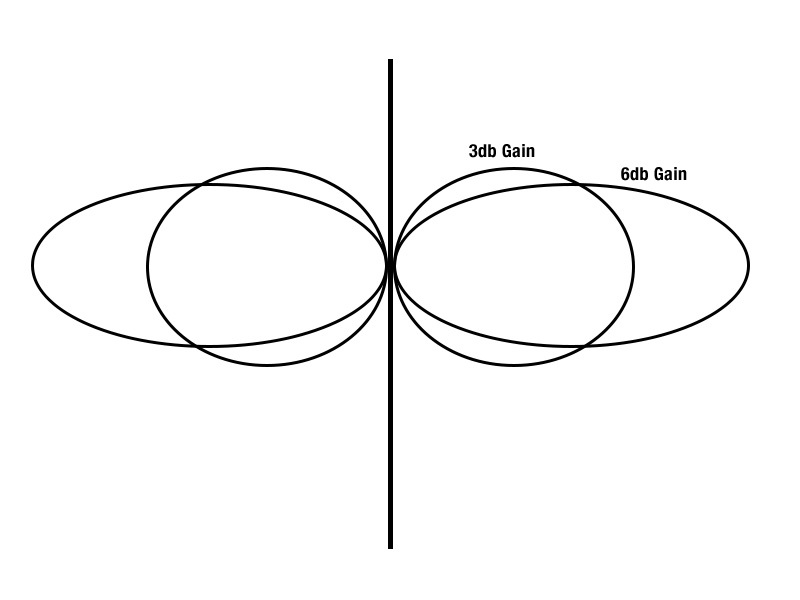 The highest gain antenna may not be the answer. Use the HAAT calculator to find out how terrain can affect antenna performance. This was very educational and informative. I really never knew the difference in patterns for each antenna. Thanks for explaining. By the way, I live -22 meters below HAAT, so from the information i just learned, the Slim Jim would be the best choice. Hopefully soon I’m hoping to purchase one of yours! KK4UCG here, thanks for this great info! My HAAT calculation was 15 meters. I am using a roll up ladder line slim jim at the moment, and it seems to work well. I got my ticket only 2 months ago. Can you explain any advantage in a copper slim jim to my ladder line version? Andy, the differences between the ladder line and copper Slim Jim are minor. Ladder Line Slim Jim antennas are really designed for portability, they are lightweight and low power. The are perfectly suitable for using in the field with a portable radio. But I wouldn’t transmit more than 10-20 watts of power through them. The Copper Slim Jim Antenna is designed for base station operation. It is rugged, dependable and will stand up to years of harsh weather conditions. Plus you can transmit 100+ watts of power in the antenna without fear of burning it up. For temporary use, I’d go with the ladder line version, if you want something you can install once and not worry, reach for the copper. Just did my HAAT calculation and I am +47 meters…which is why I can hit a 2-meter repeater 25 miles away with only 1 watt on my BaoFeng using a Flexible Slim Jim hanging in my office. Since I’m new to ham radio I’m still looking for an external antenna solution. Since I have a dual-band HT, do you all have a dual-band copper antenna solution like the Flexible Slim Jim? I know my flexible antenna is a Slim Jim on 2 meters and a J-pole on 440 MHz, I’m just curious what my options are for copper dual band antenna’s. My Avg HAAT comes out at 9m, but effectively about -7 because the direction I’m most interested in is North.